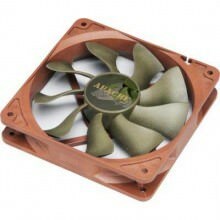 Super silent 12cm fan with S-FLOW blades supplying 30% more airflow than a standard fan at the same speed. The greater performance combined with PWM automatic speed control allows the fan noise to be kept to a minimum.The Apache fan creates more focused airflow providing blind-spot cooling, which makes it an ideal solution for a case or heatsink fan. HDB (Hydro Dynamic) bearings extend fan life and further enhance noise reduction. IP54 military standard ensures the fan is dust and moisture resistant. It’s powerful, quiet and tough! IP54 Military Standard Approved Moisture and Dust Protection! Click the button below to add the Akasa 120mm x 25mm Apache Camo Super Silent PWM Fan (Hydro Dynamic Bearings - Camo) to your wish list.